Sports Profile – Rory McIlroy! He has represented Europe, Great Britain & Ireland, and Ireland as both an amateur and a professional Golfer! He started playing golf exceptionally young taught by his father, who coached him from the age of 18 months. His father is also a fine golfer, who once played at a scratch handicap level. Rory gave early evidence of his golf potential by hitting a 40-yard drive at the age of just two years. Rory was very keen for the sport from the start, and asked his father every day to take him to the golf course. An old family story relates Rory receiving a new golf club as a present, being shown the correct grip by his father, then taking the club to bed with him that night, with his hands holding the club properly. Once Rory’s golf talents started to show, his Father held down several jobs to earn additional income for his son’s golf development, and his mother Rosie worked extra shifts at the local 3M plant. His first significant international victory came in the World Championship for the 9–10 age group bracket at the Doral Golf Resort & Spa in Miami, Florida. McIlroy learned his early golf at the Holywood Golf Club, which he still retains as his home course. Rory became the youngest club member at age seven and started training with Michael Bannon, previously the Golf Professional of Holywood Golf Club, who is also his current coach and dedicated mentor. At age 15 he was a member of Europe’s winning 2004 Junior Ryder Cup team; in 2005 he became the youngest-ever winner of both the West of Ireland Championship and the Irish Close Championship. He retained the West of Ireland Championship in 2006 and followed that up with back-to-back wins at the Irish Close Championship. In August 2006, he won the European Amateur Championship at Biella Golf Club, near Milan, Italy with the score of 274. In October 2006, McIlroy represented Ireland in the Eisenhower Trophy, the Amateur World Team Championship. On 6 February 2007, he became the second man to top the World Amateur Golf Ranking, though he lost the top spot after just one week. McIlroy kept getting better and was part of the Great Britain & Ireland team at the 2007 Walker Cup. McIlroy’s overall record was (1–2–1) in Win-Loss-Tie format. McIlroy made his first appearance in a European Tour event a few days after turning 16, when he took part in the 2005 British Masters. He made the cut on the European Tour for the first time as a 17-year-old at the 2007 Dubai Desert Classic, where he had to forego prize money of over €7,600 (0h no) due to his amateur status. McIlroy turned professional on 19 September, which was the day before the Quinn Direct British Masters he was only 17! McIlroy became the youngest Affiliate Member in the history of The European Tour to earn a tour card.The next week, he secured his card for 2008 by finishing in a tie for 4th place at the Open de Madrid Valle Romano, proving that he maybe young but he can play Golf!!! McIlroy entered the top 200 of the Official World Golf Rankings for the first time on 27 January 2008 (Woop Woop) McIlroy then went onto finish the 2008 season ranked 36th on the European Tour Order of Merit. After finishing second in the UBS Hong Kong Open in November 2008, McIlroy attained his highest world ranking position of 50.He finished the 2008 calendar year at 39th in the world rankings. This earned him an invitation to the 2009 Masters Tournament. His first professional win came at age 19 when he won the Dubai Desert Classic on 1 February 2009, this win took him to 16th in the world rankings, he moves fast!! In April 2009, McIlroy appeared at The Masters in his first major tournament as a professional and his first ever Masters Tournament. He finished the tournament tied for 20th place, two shots under par for the tournament,amazing for someone soo young!! McIlroy finished the 2009 season ranked second on the Race to Dubai, behind Lee Westwood, and in November he entered the top 10 of the world rankings for the first time. 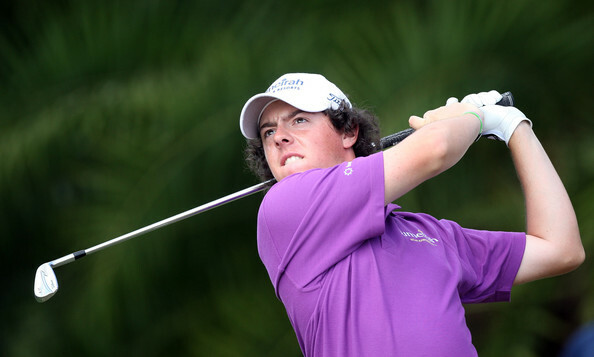 McIlroy finished 2009 ranked 9th in the world. 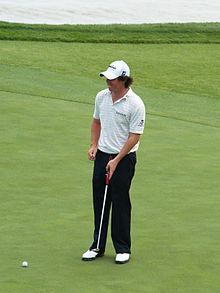 On 2 May, McIlroy recorded his first PGA Tour win after shooting 62 in the final round of the Quail Hollow Championship. He set a new course record, and concluded with six consecutive scores of threeand became the first player since Tiger Woods to win a PGA Tour event prior to his 21st birthday!! On 4 October 2010, McIlroy won a crucial half-point to help Europe regain the Ryder Cup.Following the Ryder Cup, he announced in November that he would return to play full-time on the European Tour. He made the decision due to having closer friends on the European Tour, his part in the Ryder Cup victory, and wanting to be nearer his girlfriend and family. On 7 April, McIlroy shot a bogey-free 7-under-par 65 in the first round of the Masters Tournament in Augusta, Georgia to take the lead after the first day of the four-day competition. He is the youngest player to ever lead the Masters at the close of the first day breaking more records!! On 17 June during the second round, McIlroy became the first player in the history of the tournament to amass a score of 13-under-par at any point in the tournament. He achieved the feat by making a birdie at the 17th hole in the second round. Despite a double bogey on the final hole, his two-day total of 131 (65–66, 11-under par) set a record as the lowest 36-hole total in U.S. Open history, he is on Fire! !The score was one better than Ricky Barnes’ 132 in 2009. He was also the fastest golfer to reach double digits under par in the U.S. Open, reaching 10 under par in 26 holes. Wow that’s a lot for someone soo young to achieve and he has the rest of his life to achieve more!!! Lets hope he doesn’t end up like Tiger Woods!! This entry was posted in Sports News!, Sports Profile, Uncategorized and tagged Golf, Rory McIlroy, Sports Profile. Bookmark the permalink.